Whilst in treatment for addiction at Broadway Lodge, clients are able to express themselves in alternative ways to verbal or written communication in sessions such as art or music therapy. Through the rehabilitation process, creative talent often emerges and old passions can be rediscovered. We are wonderfully inspired when we see this talent blossom and develop once the individual is clean/sober in recovery. 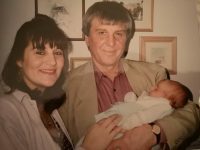 Markkus (Head of Counselling) recently spoke to Verity Elsbury (aka Tat), a former patient who was in treatment for just two weeks to detox at Broadway Lodge and is now over four years clean. She has maintained her recovery through the 12 Step programme and following the advice that was given to her at Broadway Lodge. 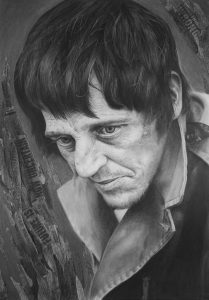 Verity has proven to be a very talented artist – evident in her portraits within this blog. She’s been embarking on a project called ‘Homeless not Helpless’ and has sensitively explained in her own words the idea behind the project and its importance below. Verity has not only maintained her recovery but she is doing inspirational work supporting others, amazing work Verity. Homeless not Hopeless is a project not only highlighting the issues of homelessness but allowing others to re-humanise the homeless community and their views around the subject. We see homeless people so often and watch the problem worsen, and we feel like we cannot help the situation and sometimes may even think ‘it’s not our problem’. After a while we begin to turn a blind eye to the issue as we don’t know how to help. By ignoring the problem we actually create a gap between “us and them”. After a time we begin to forget these people are individuals with their own stories and reasons as to why they are homeless and how they got to this point. The homeless community often end up labelled as “hopeless”, “useless”, “beyond help”. This project aims to change this view and allow people to realise that the homeless community are approachable and being ignored is often detrimental to their self-esteem and causes even more problems. In November 2018 myself and photographer Dee Robertson went out around Bristol and interviewed members of the homeless community asking them questions to find out how and why they got into their situation, what their aspirations for the future are, whether they are accessing organisations for help, their experience on the streets, how they feel that the public view them, etc. 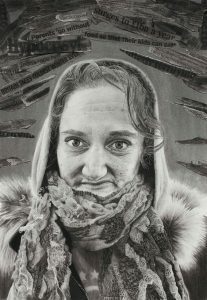 Dee Robertson took photos of which I drew from in a hyperrealism style (drawings that look like photos) using graphite powder, pencils and charcoal pencils. Adding backgrounds collaged from newspaper clippings based on subjects closely and directly related to homelessness, with the intention of one day putting on an exhibition showing the art (photos, drawings) and adding the interviews, so that the public could see their faces and hear their stories. Each individuals’ story was different and there were many reasons behind why they ended up homeless and each story was striking as we realised it could happen to any one of us no matter what our backgrounds, education etc. Although I have not yet organised an exhibition, I have put the work out on social media sites and many people have admired it. I am grateful for all the feedback and especially to find out that many people have now recognised the individuals on the streets of Bristol and felt like they can approach them and have a chat. People have shown the subjects images of the artwork and I have been told that they are chuffed that they have been recognised on multiple occasions and have been able to have members of the public engage with them as equals instead of feeling ignored. This project has already had a small positive outcome in this way. I was surprised and grateful for the subject’s willingness to engage with the project and open up to me about their stories. I can say that I personally experienced a great positive change in my own often pre-set stereotyped views and I feel a great deal of compassion for the homeless community and especially the individuals who I had met and who were so helpful and welcoming to my ideas for this project. I hope that they can access the organisations out there and get the help they need to become homed soon. I hope that the public respond to the project positively and not only have the same experience I had, but also feel like they can approach these people or even just say ‘hi’ as they are walking by. Sometimes small changes can have great outcomes for others. Below are the drawings created along with a summary of the individual’s circumstance. Homeless not Hopeless – David is one image of a series reflecting the stark realities of life on the streets while also hinting at elements of hope and humanity. David is an addict who sleeps on the streets and lives day to day trying to fund his addictions through crime. He is consistently shunned and alienated by mainstream society. David has developed a lack of trust in ‘the system’ and finds himself isolated not only because of his circumstances but increasingly because he no longer believes there is any real help for people in his position. 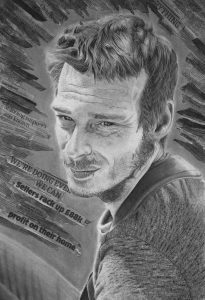 I have used graphite powders, pencils and charcoal powder to create a bleak and dark feel for this image reflecting a look of defeat in the subject’s face. I have used newspaper collage in the background with various words that hint at the issues of lack of housing and homelessness. My intention was that the collage surrounding the subject would create a claustrophobic feeling of being trapped by circumstance and the difficulties of finding a way back into housing and being accepted by the rest of society. 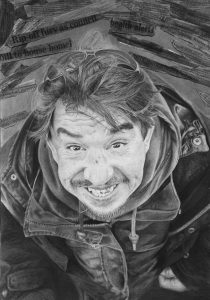 Homeless not Hopeless – With this image of a kind face looking straight at the viewer, I wanted to challenge the public’s view of why the homeless end up in their situations. It is a common misconception that homeless people have little to offer society, that they are less educated, too lazy to get into employment and that they are all substance abusers. Although a lot of people turn to substances whilst on the streets to cope with their circumstances this is not necessarily why they ended up there in the first place. Often, they have simply found themselves the victims of circumstances that could affect any one of us. Family fallouts, relationship breakups, domestic violence and unemployment often play a big part in causing homelessness. Ramone is not an addict. He was ill equipped for the circumstances he found himself in. He struggled with council benefit forms and had no support to help him fill forms correctly and follow up with the council. Without that support and without benefits he ended up on the streets. I have used graphite powders, pencils and charcoal powder for this image to create tension between the darkness of the situation and the hope of a kind face. The collage of press cuttings in the background, while hinting at the issues of lack of housing and homelessness also draws the viewers eye towards the almost perceivable smile on Ramone’s face. Homeless not Hopeless– Justin has been homeless for many years now but has only moved to Bristol recently, attempting to access more help for himself and his partner. They have been on the streets for eight years now. Although it is unclear whether they became homeless for the same reasons, it is certainly clear that they rely upon each other a great deal. It was incredibly cold the morning I met them both and they were doing a lot of drinking to stay warm. The image I have used for my portrait depicts Justin’s playful and unbroken spirit against all odds. I wanted this image to illuminate the small moments of hope between all the doom and gloom associated with being on the streets. Justin was not prompted to grin at the camera, he simply reveled in the fact that he was noticed by another person. I have used graphite powders, pencils and charcoal to create the tones in this image and have added cuttings of newspaper related to homelessness, supporting the narrative of Justin’s current situation and creating a juxtaposition between the difficult times and Justin’s resilient character. Homeless not hopeless– Jane Doe has been homeless for eight years due to a previous violent relationship. She frequently visited women’s shelters and after being raped and attacked multiple times, is now on the streets with her partner Justin. Jane Doe comes from a dysfunctional family who she no longer has any contact with. She moved in with a previous partner who became physically violent. At that time, she did not want to move in with friends as she was afraid of putting them in danger. She ended up on the streets. After many years of homelessness, she and her current partner moved to Bristol to access better support although they remain disappointed in the level of that support. Jane Doe and her partner seemed to have other friends who were coming and going that day and there was a sense of comradery whilst they drank cider together to stay warm. Homeless not Hopeless – Kevin has been homeless for seven months due to a set of unfortunate circumstances. He is not a drug addict, nor does he have a drink problem, he became homeless in Weston-super-Mare due to a relationship break up. He was looking to get back into work a few days prior to me meeting him but was attacked whilst sleeping rough. The injuries he sustained mean he cannot work. He came to Bristol because he was told there was more support available for people in his situation although unfortunately, he feels that not to be true. Looking cold and defeated, this image of Kevin was captured as he was sat begging in the winter sun. 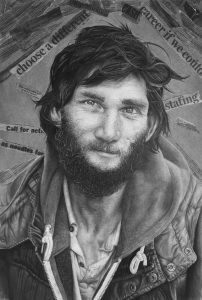 I have used graphite powder, pencils and charcoal to create the contrast of light and shadow on his face, and I have added newspaper cuttings hinting at the problems of homelessness and the unfortunate circumstances beyond his control which contribute to his struggle to get back to normal living.